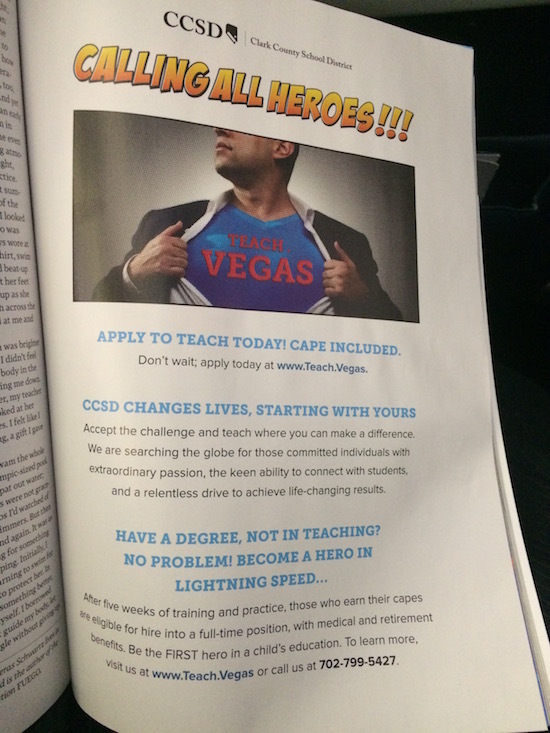 I was on a flight when I came across a .Vegas domain name “in the wild.” The Clark County School District (CCSD) is using the Teach.Vegas domain name in its marketing materials to recruit new teachers into the school district. When you navigate to Teach.Vegas, visitors are redirected to the jobs/career subdomain within the Clark County School District website. The school district uses CCSD.net for its primary domain name, and the TeachVegas.CCSD.net subdomain for its recruiting url. In my opinion, the Teach.Vegas domain name is easier to remember than the longer url, so it makes sense for them to use it in their marketing materials. As you can see in the advertisement, the school district has a “www.” in front of the Teach.Vegas domain name. I would imagine this is to reinforce that this is a domain name that people should visit. I have also seen companies add the http:// in front of a new domain name to serve the same purpose. For those who are wondering, the TeachVegas.com domain name was created back in 2012, so it would not have been available for the school district to use had it chosen that instead. Teach.Vegas was registered about two years after the .com domain name was registered. The Clark County School District is quite large. According to the About page on its website, CCSD is the fifth largest school district in the United States. There are more than 315,000 students in the school district. As you might have figured, the city of Las Vegas is located in Clark County, and I presume Las Vegas is the city with the most students in the district. In my opinion, this is a smart usage of a new gTLD domain name. Thanks for posting. This distills a lot of the back and forth we’ve seen on the domain industry blogs the past three years regarding how end users will employ modern domains and as one can see it boils down pretty simple…people will sooner or later find new resources to work with. Todays DomainInvesting article about a school system just caused me to realize in the three years I’ve been reading DomainInvesting, TheDomains, and DomainNameWire, I don’t recall ever seeing the TLD .EDU in print or ever spending any time thinking about it. Sometimes I think about .GOV and .MIL, but totally forgot about .EDU this entire period. Like the .Vegas school system’s departure from .EDU’s intended purposes, the British government uses http://www.parliamentlive.tv for streaming the House of Commons and the Prime Minister. .EDU has been in mass use across the U.S. for a number of years although it’s true you don’t generally see ads for it. Now, there is .EDUCATION which in some respects is a better domain space. It’s gaining ground abroad. About 40% of .EDUCATION registrations are in the U.S.